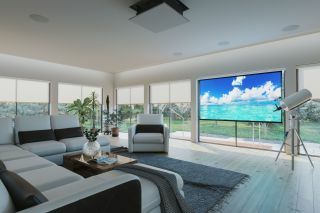 The What: Screen Innovations (SI) has introduced the Solo 2, an all-new, re-engineered version of its Solo family of screens. The What Else: The Solo 2 has a compact cassette design that is 17% smaller than the original, but with a much wider array of options, such as sizes up to 160” diagonal and nearly any power option imaginable. One of those notable power options is a rechargeable motor option, a patent-pending design that uses a magnetic charging port to recharge a lithium-powered motor. In addition to the rechargeable motor, a low-voltage (24v) motor is available, both which greatly simplify the integration and installation process. AC power options are newly available with wireless (RTS) or wired (RS485) control. Material options have not skimped either with options such as Slate, SI’s optical (ambient-light rejecting) material, and “Short Throw.” Additionally, SI has included their highly refined white and gray materials, also rated for 8k projection. The Bottom Line: SI is accepting Solo 2 pre-orders now and will begin shipping starting on April 2, 2019.